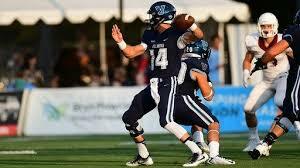 VILLANOVA ROLLS PAST LEHIGH 31-9 TO START 2-0! Villanova has gotten off to start just as quick as Temple’s has been non-existent! Zach Bednarczyk (above) threw for three touchdowns as the visiting Cats crushed beating Lehigh 31-9 on Saturday. 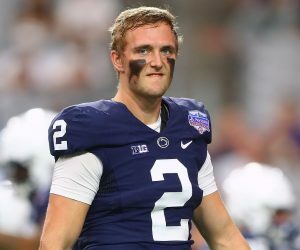 Bednarczyk, who had three touchdown passes last week in Villanova’s 19-17 upset win over Temple, finished with 215 yards passing. Jarrett McClenton had 114 yards and two touchdowns receiving and Ryan Bell caught another scoring pass. The Wildcats (2-0) got off to a slow start with Bednarczyk throwing an interception on the team’s second drive, which led to a Lehigh field goal. Bednarczyk then took the Wildcats 63 yards in nine plays and Justin Covington ran it in from three yards out to make it 7-3 with 1:34 left in the quarter. In the second, Bednarczyk hit McClenton for a 62-yard touchdown and Bell from four yards to extend Villanova’s lead to 20-3 at halftime. Previous SERENA LOSES HER COOL AND THEN US OPEN TITLE TO OSAKA, WATCH! Next BUFF WAS TOO TUFF FOR TEMPLE (0-2), 36-29 AT THE LINC!